Controlling the flow of heat through semiconductor materials is an important challenge in developing smaller and faster computer chips, high-performance solar panels, and better lasers and biomedical devices. For the first time, an international team of scientists led by a researcher at the University of California, Riverside has modified the energy spectrum of acoustic phonons— elemental excitations, also referred to as quasi-particles, that spread heat through crystalline materials like a wave—by confining them to nanometer-scale semiconductor structures. The results have important implications in the thermal management of electronic devices. Led by Alexander Balandin, Distinguished Professor of Electrical and Computing Engineering and UC Presidential Chair Professor in UCR's Bourns College of Engineering, the research is described in a paper published Thursday, Nov. 10, in the journal Nature Communications. The paper is titled "Direct observation of confined acoustic phonon polarization branches in free-standing nanowires." The team used semiconductor nanowires from Gallium Arsenide (GaAs), synthesized by researchers in Finland, and an imaging technique called Brillouin-Mandelstam light scattering spectroscopy (BMS) to study the movement of phonons through the crystalline nanostructures. By changing the size and the shape of the GaAs nanostructures, the researchers were able to alter the energy spectrum, or dispersion, of acoustic phonons. The BMS instrument used for this study was built at UCR's Phonon Optimized Engineered Materials (POEM) Center, which is directed by Balandin. Controlling phonon dispersion is crucial for improving heat removal from nanoscale electronic devices, which has become the major roadblock in allowing engineers to continue to reduce their size. It can also be used to improve the efficiency of thermoelectric energy generation, Balandin said. In that case, decreasing thermal conductivity by phonons is beneficial for thermoelectric devices that generate energy by applying a temperature gradient to semiconductors. "For years, the only envisioned method of changing the thermal conductivity of nanostructures was via acoustic phonon scattering with nanostructure boundaries and interfaces. We demonstrated experimentally that by spatially confining acoustic phonons in nanowires one can change their velocity, and the way they interact with electrons, magnons, and how they carry heat. 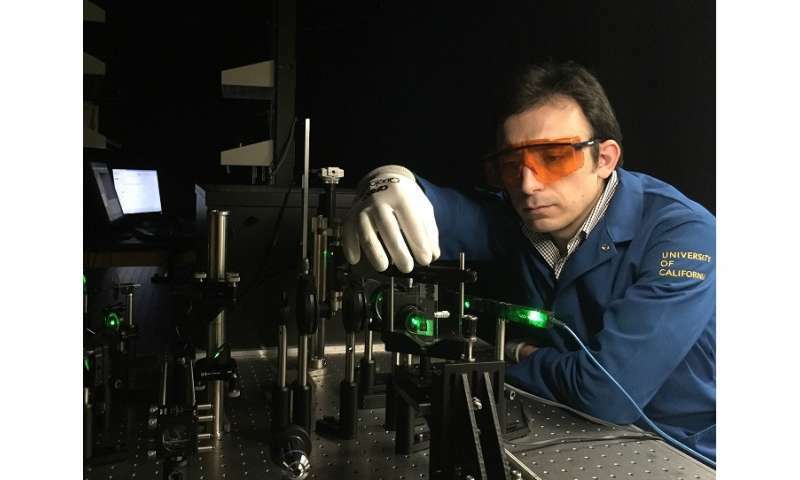 Our work creates new opportunities for tuning thermal and electronic properties of semiconductor materials," Balandin said. Can heat be controlled as waves?